I never know how it happens. One second I’m asleep, and the next second passes with the fluttering of lashes and the opening of my eyes. Then, quite suddenly, I’m awake. But not half-awake. I don’t mean the kind of subtle consciousness so fleeting that one may slip from it in an instant, only to become lost, once again, in their dreams and soft sheets. I’m talking about the awake that you can’t ignore. The awake that you can’t let slip away. The awake that passes, “get out of bed, you lazy bum, and take a shower,” into unprepared ears and jars you from your sleep. This sudden sense of being awake used to be all I knew. I never found myself in that state of wakening and reawakening in the past because the second my eyes opened, I was always ready to go. On the contrary; lately I flutter my lashes and see the sun ethereally shining through the drapes, blink once, and I am out. Of course, I never realize it’s happening until it’s too late. My soothed soul would not protest, but I, stepping groggily from my room around 9 or 10 on some days, have entirely different thoughts on the matter. I hate getting up so late. I miss my jarring transition into consciousness. I think I’m subconsciously trying to prepare myself for the looming fall semester. Early morning classes and late nights last year left me chronically sleepy; bowing my head embarrassingly in class and nearly falling from my chair on more than one occasion. I know that I can’t “catch up” or “stock up” on sleep – and I don’t want to – but my subconscious definitely begs to differ. Which isn’t a huge problem really, it’s just that getting out of bed so late in the morning doesn’t make me feel all that great. I don’t feel refreshed stumbling out of bed, but bogged-down instead. I feel as if I’ve gotten such a late start that I can’t accomplish anything, and that frustrates me. So I’m working on fixing this little ‘problem’ by giving myself early morning incentives. Incentives like drinking the first cup of coffee, tiptoeing through the morning dew to get to the garden and getting to the grocery store before the crowds. They’re just a few things on a long list, but you know what? 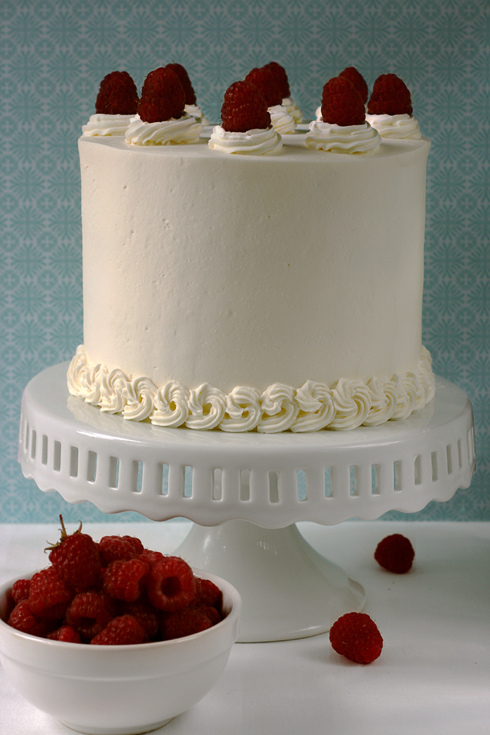 The cake in the book was frosted with an unstabilized raspberry whipped cream, which I didn’t like. So, instead I made two kinds of mousses a little differently than suggested for the fillings and frosted with a more stable Italian Meringue Buttercream. I think my changes made the cake a lot more structurally sound, which, in my opinion, is very important! This cake tastes good, but I had a lot of trouble with it sinking. 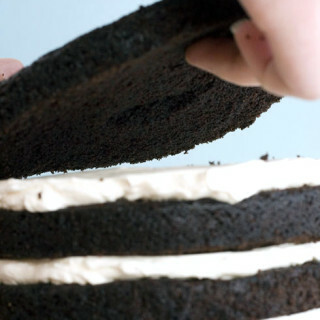 The top layer in the cake had almost no center, which is why it didn’t slice very nicely. 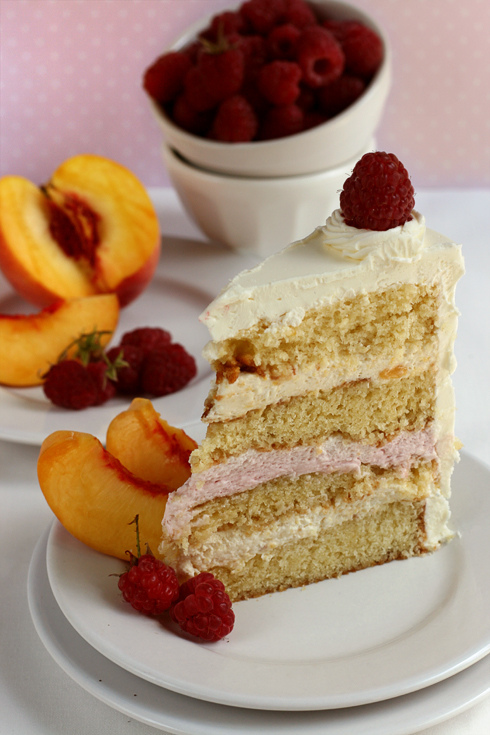 I used fresh peaches for this, but I think frozen ones might be better because they are generally more uniformly “peachy.” Mine didn’t taste all that great on their own, so their flavor in the finished cake was not as pronounced as I would have liked. 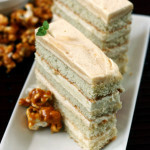 I just love your blog, and I wish we were friends (in real life) so that I could sample these sweet treats. They look amazingly good but not too perfect. And I mean that in the best way. They&#39;re, like, homemade-perfect, which is preferable to grocery-store- or bakery-perfect.<br /><br />I&#39;ll be quiet now. Towering and beautiful!! It sounds so tasty, too! This is easily the most beautiful frosted cake I&#39;ve ever seen. It&#39;s so smooth! That is a marvelous feat of baking and decorating! Truly gorgeous! I&#39;m inspired! 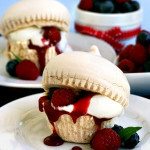 My mouth doth drool……………….<br /><br />gorgeous photos, yummy looking recipes! omg, what a beautiful cake!! 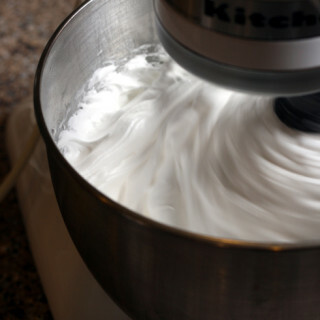 Definitely, something as tall as that does require a more solid italian meringue frosting… great job! 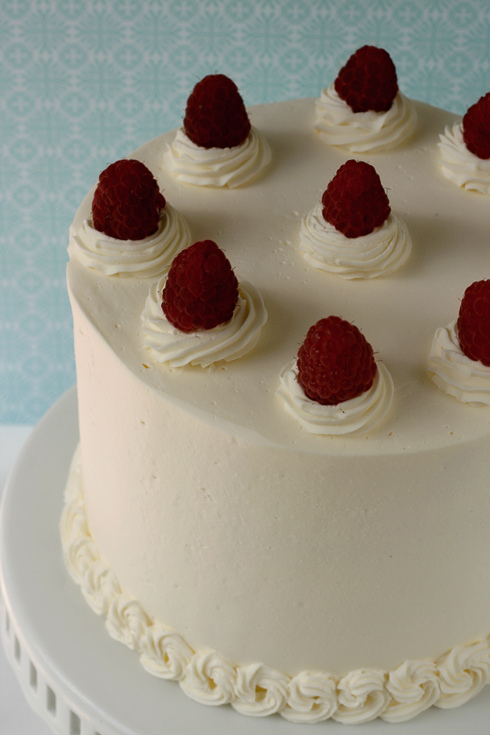 It&#39;s such an epic cake – beautiful with the raspberries. What a gorgeous job you did decorating that cake! And good luck with getting up early. It wasn&#39;t until I was working everyday at 7am that I got used to waking up early…and even then it was hard. Once you have kids though…then you get up early just to have time to yourself! It&#39;s such a pretty cake!<br /><br />I am useless at smooth sides. It does me good to see that it can, in fact, be done! 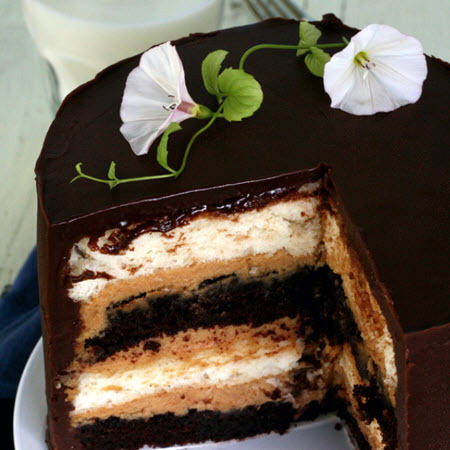 We want a slice of this completely gorgeous and mouth-watering cake! It&#39;s perfect!! I made the sky high cake for my birthday, and although it was good, it was an absolute mess! The cake looks fantastic! I&#39;m super impressed by your icing skills. 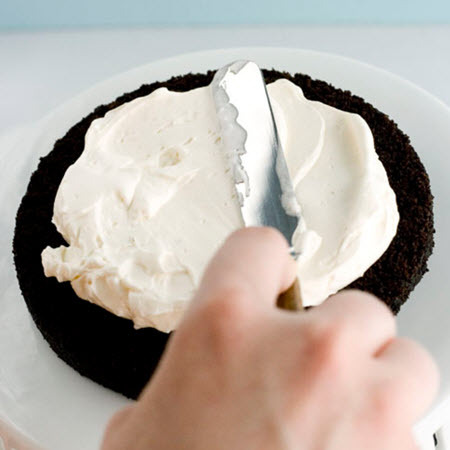 I use the same buttercream recipe as you, but I can never get it to spread that well. 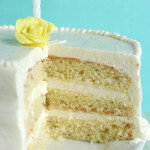 Oh how I love a tall layered frosted cake! It&#39;s a shame it sunk in the middle. I do love a whipped cream frosting, but I agree…for serving to people it sure isn&#39;t pretty or stable. 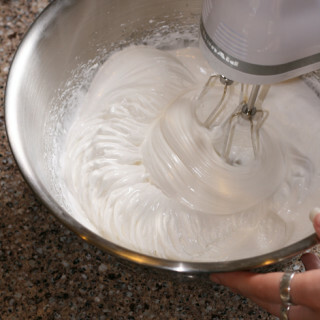 The Italian Meringue buttercream looks gorgeous. Lovely cake decorating skills with your spatula and piping bag! This looks divine! Have you posted the pictures on Fiddme yet? omg, YUM! 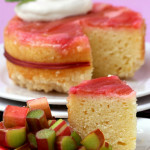 this looks so good–I really want to sink a fork into my computer screen! 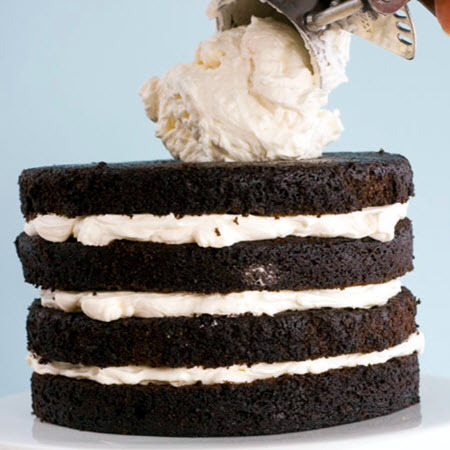 I am utterly amazed at the smoothness of your buttercream–how did you get rid of the spreader lines? 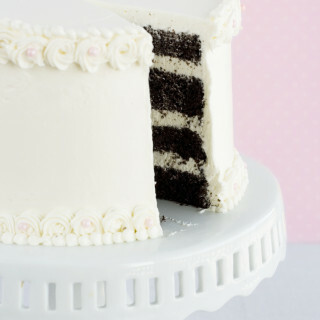 That cake looks like perfection! And summery and delicious too. Cake is just perfect. I love simple decorations. So elegant and natural. Hats off to You! So glad you guys like the recipe! Thank you!! in the rainbow cake do you add any flavoring in the colors ?? So I’m waaay back in the archive lol but I just wanted to say how much I love your blog, Kaitlin! I’ve been reading it for years and I honestly think it’s the best out there. You’re so kind! Thank you, Eleanor, I really appreciate that! 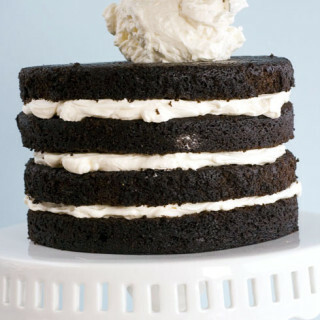 I’m so thrilled that you and your guests liked the cake – and that it turned out just fine without the sour cream! I know how scary that can be to realize 😉 Thanks for reporting back! !